The element iron is a natural accompanying element or impurity of aluminum and is added to many primary aluminum die casting alloys in order to prevent the casting sticking to the mold. 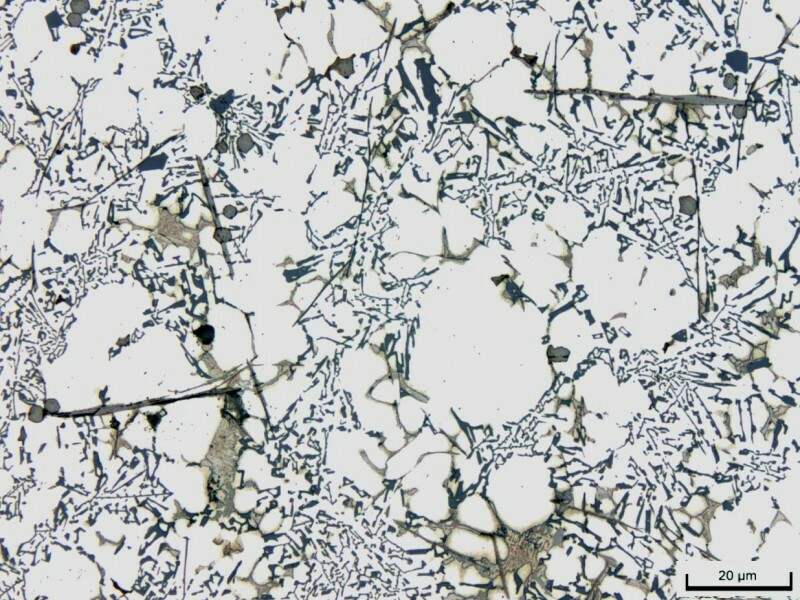 However, in addition to the positive effect of reducing the tendency to stick, considerable disadvantages occur as, during solidification for iron contents of over around 0.5%, large ferrous and intermetallic phases precipitate in the structure. Due to the kinetics of the solidification, these phases form in many complex forms. However, they mainly occur in rough flat, polygonal or fan-shaped structures (Figures 1 and 2). This causes a high proportion of the ductility potential of the aluminumdie casting alloy to be lost; the achievable yield strength decreases significantly with increasing iron content. High requirements regarding the ductility of the casting require die casting alloys with low iron contents to be used. The addition of manganese has proved to reduce the tendency to stick. 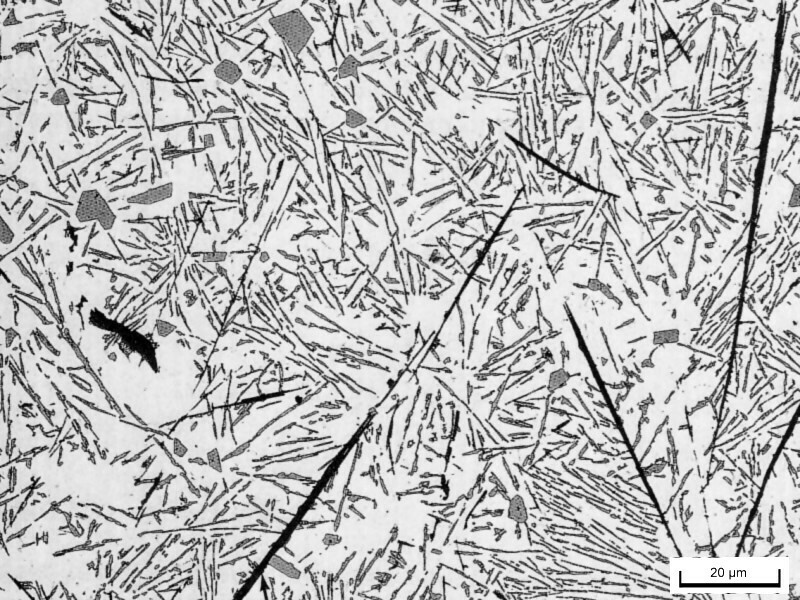 Similarly to iron, manganese reduces the tendency to stick in the die, however, the diffusions which form during solidification are characterized by a morphology which is more advantageous for ductility (as they are less needle-shaped) (s. Iron needles). In addition to manganese, chromium and cobalt can also be suitable alloy elements which can be added to reduce the tendency to stick. However, at the same time, contents of these alloy elements which are too high can also lead to undesired effects such as intermetallic diffusions in the holding furnace (in the form of furnace sludge) and/or in the casting. In recent years, the aim of the development of ductile die casting alloys was therefore to create the optimum composition which, on the one hand, ensures a low tendency to stick and, on the other, reliably prevents the formation of inclusions. The chemical composition of certain selected alloys from an alloy manufacturer are given in Table 1. For the constructor and the casting user, the question of the ductility and strength often arises in the design and concept stage. In general - and highly simplified here - the loads in the elastic areas are clarified and calculated for statistic extreme cases. The 0.2% yield strength (Rp0.2) is relevant for these cases and the values of the achievable elongation at failure are crucial for the verification of ductility. The property profile of the alloys can therefore be determined in a stress-strain diagram. 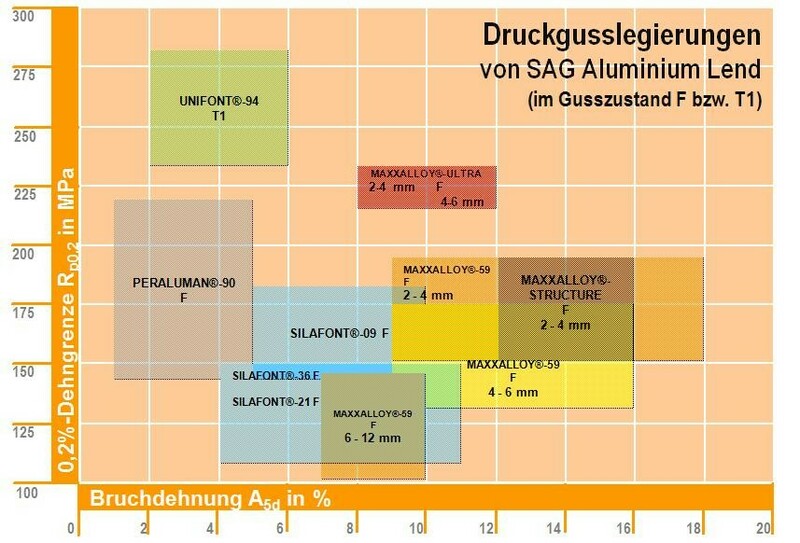 The property profiles for certain ductile die casting alloys with low iron contents are given in Figure 3, whereby the areas only apply to the cast state. The property field can be expanded further with a targeted heat treatment of hardenable alloys (Al Si9MnMg or Al Si10MgMn). In principle, it is a natural law of metals that strength and ductility compete with one another. This can also be seen in Figure 3. The high-strength, self-hardening alloy of type Al Zn10Si8Mg (brand name UNIFONT®-94) has a low elongation at failure, while the ductile alloys of type Al Mg5Si2Mn only displays low to medium 0.2% yield strength values. 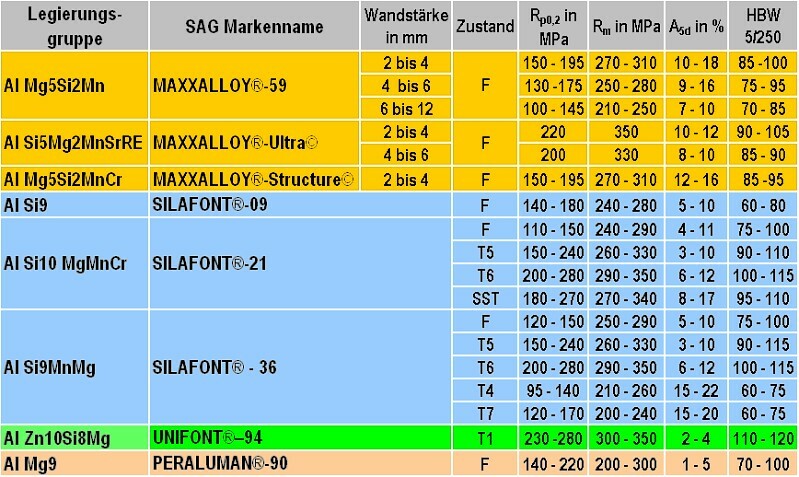 A good compromise here is the alloy of type Al Mg5Si2MnCr (brand name MAXXALLOY®-ULTRA© ) which is both strong and ductile, whereby, however, a dependency on wall thickness must be considered. In the area of the wall thickness of between 2 and 4mm, higher values are achieved (both Rp0.2 and A5d) than for wall thicknesses above 4mm. The alloys and their properties are described below. The static mechanical properties depending on the wall thickness and the heat treatment conditions (material condition) are summarized in Table 2.